Project upgraded to the blaze plan due to activity in the google cloud platform console. I do nothing and received an alert. Sorry for the confusion here. Although your project appears to be on the Blaze plan, it still has the Spark plan limits. As soon as you use any paid features, your project will be switched to Spark and you will not be charged. The reason that this happened was Google Maps Platform has changed their service to require a billing account as of July 16, 2018 (announced May 2, 2018). To prevent your maps service from being disabled, the Maps team attached a temporary billing account to your project. This temporary billing account WILL NOT generate any charges and will be removed if you use any service (Firebase or Cloud) which would incur a cost (at which time Maps will become disabled for your project). To move forward, you have two choices here: You can disable the Google Map APIs for your project or you can upgrade to a full billing account using the Maps Platform upgrade flow. We recognize that we didn’t coordinate well with the Maps team and failed to communicate this change effectively. Sorry for this. We’ll work to do better in the future. More information on the Google Maps API changes are available at their website. 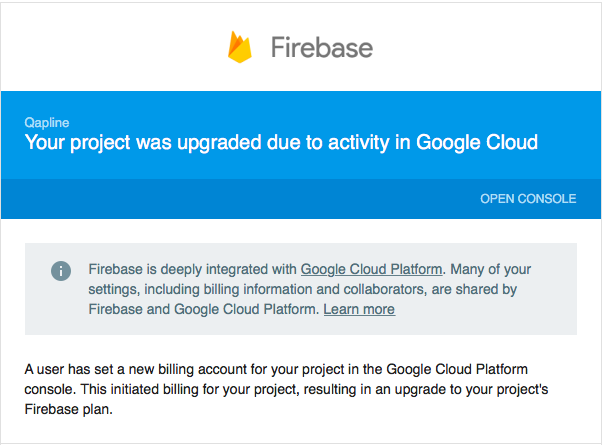 During the past few days, you may have received an email informing you that one of your Firebase projects has been upgraded to the Blaze plan. This upgrade will not affect your usage of the Firebase free tier, and you can continue to use it as normal. Although your project shows that it is on the Blaze (pay as you go) plan, it still has the Spark (free) plan limits. As soon as you would incur any charges, your project will be switched to Spark but you will not be charged. Google Maps Platform made some changes recently, and now requires a valid billing account. We detected that you have used Maps APIs from your project during the past month. In order to prevent disruption, a temporary billing account was attached to your joint Google Maps Platform and Firebase project. This account (named “Google Maps Transition Billing Account”) authorizes your project for $200 of free monthly usage of Maps Platform. As a side affect, your Firebase account was upgraded to Blaze, although it still has the Spark (free) plan limits. We apologize for not communicating this ahead of time. Note that this temporary billing account has no attached credit card, and it’ll be removed once your usage goes above the free limits of Firebase, Google Cloud, or Google Maps Platform. Once that happens, you will lose access to free Maps usage until you create a new billing account and attach it to your project. To continue using Google Maps Platform we highly recommend that you create a billing account and attach it to your project. Please click the “Get Started Now” button below to add billing information to your account, or check out the new Google Maps Platform pricing guide. As always, if you have any questions or need any assistance, feel free to reach out to our support team for more assistance.